Product Description Evaluates oxidation stability by subjecting the sample to a temperature of 95°C in the presence of oxygen or dry air. For inhibited mineral oils, the sample is reacted with oxygen in the presence of water and an iron-copper catalyst. 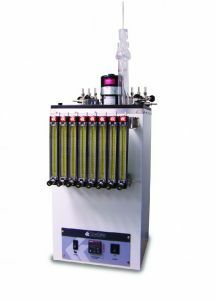 Constant temperature baths with solid state temperature control, calibrated flowmeters and condenser water manifold for oxidation stability tests on fuels and lubricants. Individual flowmeters and control valves for each oxidation cell deliver air flow at the rate of 3L/h. Condenser water manifold has individual control valves for each cell. Microprocessor PID control provides quick temperature stabilization without overshoot, and the bath is protected by a redundant over-temperature control circuit that interrupts power should bath temperature exceed a programmed cut-off point. Display provides actual set-point temperature values in °C/°F format. Communications software (RS232, etc. ), ramp-to-set and other enhanced features are available as extra cost options. Double-wall insulated baths are equipped with electronic solid state temperature control, copper immersion heaters and a 1/20 HP circulation stirrer to maintain temperature uniformity of ±0.2°C. Stainless steel bath interior has a built-in support rack and overflow/drain to immerse the test cells at the required depth. Includes oxidation cell, condenser, oxygen delivery tube, thermometer bracket, oil level indicator strip, syringe sampling tube, sampling tube holder and spacer. Additional accessories are dependent on specific test method requirements.